Your smile deserves the very best care! Whether you’re ready for your next cleaning, have lost a permanent tooth, or suffer from TMJ, you deserve a patient, understanding Plano Dentist like Dr. Andrew Benson to explain the health of your teeth and how to keep, or restore your healthy smile. Dr. Benson & his team supports your (& your family’s) goal of good oral health. To provide you with the most holistic, best care possible Dr. Benson, as a Plano Dentist, chose to spend many years training and perfecting his expertise in general dentistry, cosmetic dentistry, dental implants and TMJ treatment, as well as proper nutrition to build and maintain a strong smile. 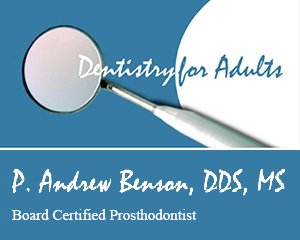 A passion for providing his patients with only the best care and treatments available including Sedation Dentistry, Dr. Benson continues his education on the latest proven methods and technology to bring you every viable choice for your preventative care regime, as well as more complex issues. Why wait? We’re looking forward to welcoming you into our Plano Dentist practice! Please call us at 972-981-8653 to learn more about our commitment to serving you. Thank you! As our Plano Dentist practice continues to grow, we recognize that our best patients come from your referrals. Thank you for your continued confidence and support! We appreciate you guiding your friends and family to our office and promise to always have time for them.